THIS IS THE GAS MASK NBC BIOWAR FILTER AND DRINKING TUBE ISSUED TO ALL ISRAELI CITIZENS BY THE ISRAELI ARMY DURING A NUCLEAR, BIOLOGICAL AND/OR CHEMICAL ATTACK, OR THE THREAT OF IT. THE 4A1 GAS MASK IS HIGHLY ADJUSTABLE AND 100% RELIABLE ONCE PROPERLY ADJUSTED WITH THE GAS MASKS HIGHLY 5 ADJUSTABLE AND RELIABLE ELASTIC STRAPS. GAS MASK COMES EQUIPPED WITH LARGE EYE-OPENINGS AND A WATER INTAKE PORT, ALLOWING GAS MASK USER HYDRATION WITHOUT HAVING TO REMOVE THE GAS MASK SO USER DOES NOT RISK ANY EXPOSURE WHILE HYDRATING. 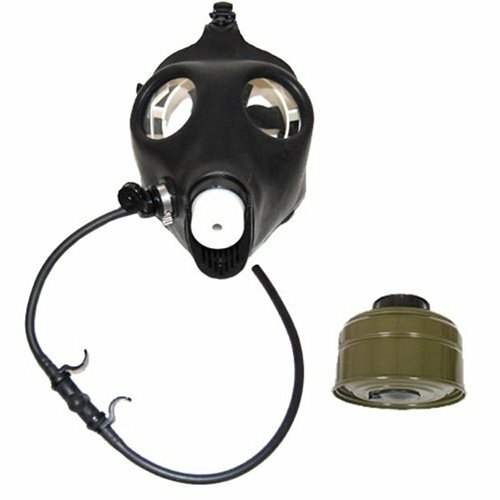 THE 4A1 GAS MASK HAS FULL BIOWAR AND NBC (NUCLEAR, BIOLOGICAL AND CHEMICAL) PROTECTION.